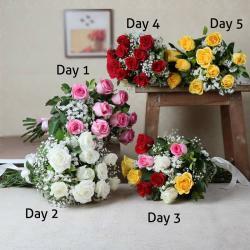 Product Consist: Day1: Bunch of 10 Red Roses, 1 Bar of Toblerone (Weight: 100 Gm) :: Day2 : Heart Shape arrangement of 30 Red Roses in a Basket, 6 inch teddy bear:: Day3 : Bunch of 6 Red Roses, 5 Bars of 5Star Chocolate (Weight: 20 Gm each), Day4: Bunch of 10 Red Roses, 16 pcs Ferrero Rocher Chocolate Box. Flowers, Chocolate and Teddy make a unique gifting idea for every occasion. No matter what the occasion is, gifting an arrangement of flowers can add an instant smile on the recipients face. 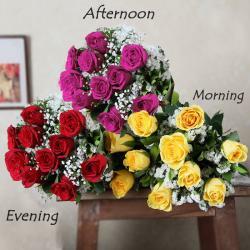 Want to express your love and affection for a special someone or friends and family on their occasion. Do it with this marvelous gift pack from our line up! Send this stunning combo as per your date of Delivery. This opulent gift combo makes for a perfect gift to send best wishes on special occasions like birthday, wedding anniversary, Valentine Day and many more. So go ahead and book the order now. This immaculate gift combo brought to you by Giftacrossindia.com is cuteness personified. 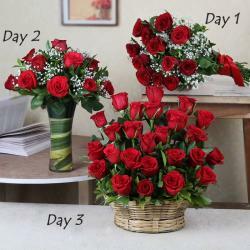 So pick this awesome combo of 4 day serenade for your loved ones for a consecutive delivery of four days in a row. Mention youre starting desired delivery date during checkout & get your gifts delivered to your loved ones at their doorstep. 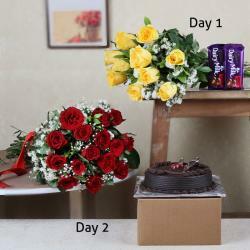 Product Includes: Day1: Bunch of 10 Red Roses, 1 Bar of Toblerone (Weight: 100 Gm) :: Day2 : Heart Shape arrangement of 30 Red Roses in a Basket, 6 inch teddy bear:: Day3 : Bunch of 6 Red Roses, 5 Bars of 5Star Chocolate (Weight: 20 Gm each), Day4: Bunch of 10 Red Roses, 16 pcs Ferrero Rocher Chocolate Box.